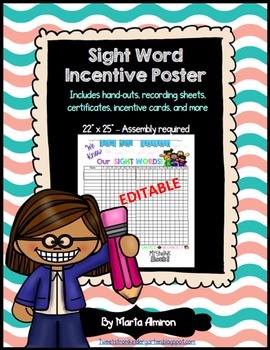 This package contains all you need to start the school year motivating your students to learn their sight words. How to use it: Type your students’ names, print, and assemble. Tip: glue all the parts together on bulletin board paper to make it stand out. As you students start to lean more and more sight words, they earn stickers, (I use those stars from the dollar store) that they paste to the poster themselves, by their name. When they earn 5 stars (20 sight words), they get a prize from the treasure chest. ✔ Incentive Poster Chart - Editable (about 22" by 25" - 2 pages by 3: landscape orientation). Fits up to 22 student names. Assembly instructions included. 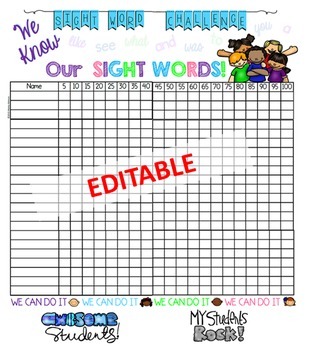 ✔ Hand-outs for parents with four lists of sight words (editable, just type the sight words from your school district). In our district, the sight words are divided in four quarters. ALSO PROVIDED IN A POWERPOINT FILE, so you have the freedom to add more words. ✔ List of activities and games parents can play with their children to help them learn the words. ✔ Recording/assessment sheets. 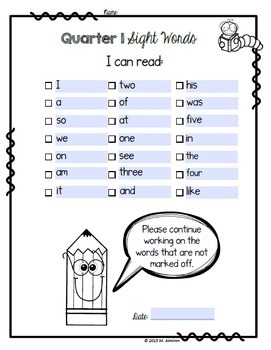 Use these when assessing by checking off the words they recognize. Send this report home so parents know what words they need to work on (it has the words from my district, but you can edit this accordingly). ALSO PROVIDED IN A POWERPOINT FILE, so you have the freedom to add more words. ✔ List of challenging activities for those children who have already learned the sight words. Many times these children can quickly recognize the words while reading, but they cannot spell them correctly when they write, so these activities are helpful with that area. ✔ Incentive cards (half page, color and B&W). 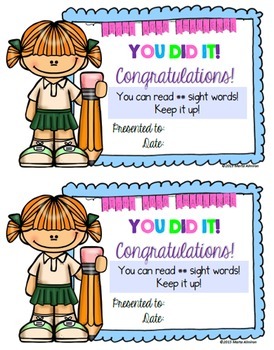 You can give these to students if you want them to have at hands a way of tracking their learning, besides the poster. This is something they can keep at their desk or in their folders. ✔ 4 different certificates (half page), color and B&W (editable, just type students name and date).